These are like giant mittens that fit over handlebars to allow the rider to operate shifting and braking using thin gloves or bare hands. They are made by hand, by me, with love, but mostly nylon and fleece. In black nylon with fleece liner and reflective cuffs. It reaches the elbows of an average 5’6″ adult. There are elastic shock cord drawstrings at the bar cuffs. 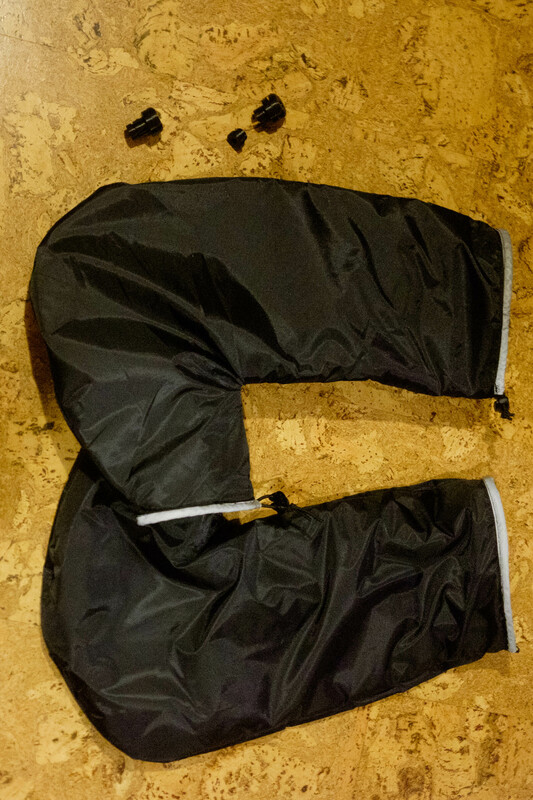 They have a stiffening welting along the outside seam to add stiffness and make it easier to get arms in. Now includes my own sandwich style bar plug – a 3 piece bar plug that secures the pogie to any standard handlebar. The plug can be left on in summer without the pogies. Interior fleece colour varies with availability. I generally purchase end-of-roll pieces to reduce manufacturing waste. Current fleece is grey, black, burgundy or navy blue. I generally advise this style for city and day use, though i have used them on 3-5 day trips. They can be used for longer bikepacking rides and expeditions, and they are light weight, which is welcome on long trips. They are intended to be easy to get in to, so they do not have storm cuffs of pockets. Winter bicycle pogies Now in Red!